Hydro crews in Ontario expect to have power restored everywhere by late Wednesday night as the first major snowstorm of the season made its way across the Ottawa Valley. Many Hydro Qu�bec customers will have to wait until Thursday, though; the utility has set up some emergency lodging for those affected. Between 10 to 15 centimetres had fallen as of Wednesday afternoon, leading to minor delays and several collisions on area roads. At least 30 centimetres of snow dropped in Pennsylvania and New York on Tuesday. By 6 p.m., the storm was already causing some cancellations of U.S. flights scheduled to arrive at the Macdonald-Cartier International Airport in Ottawa. CTV Ottawa's J.J. Clarke said the bulk of rotten weather took place overnight. It caused school closures and bus cancellations in the Upper Canada region and Ottawa. Areas currently under a winter storm warning include: Brockville, Leeds and Grenville, Ottawa, Gatineau, Morrisburg, Long Sault, Winchester, Newington, Smiths Falls, Perth and eastern Lanark County, Prescott, Russell, Cornwall, Lancaster, Maxville and Alexandria. Because many trees still have leaves on them, residents should also be aware of the increased risk of broken branches that could down power lines in many areas. Hydro crews were working hard Wednesday morning to restore power to more than 5,000 residents in Ottawa. By 8 a.m., there were only 400 residents still without power. More than 50,000 customers across Eastern Ontario and Western Quebec have lost electricity. Meanwhile. city crews have been busy clearing and sanding Ottawa's roads. Some of the wet, slushy snow will likely freeze Wednesday night, said Dan O'Keefe, the City of Ottawa's road maintenance manager. "I would advise people to be careful walking, not just on sidewalks and streets, but in parking lots," O'Keefe told CTV Ottawa. Emergency officials are reminding people not to call 911 for road conditions and closures. 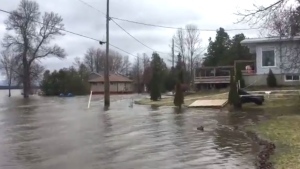 The Ontario Provincial Police responded to numerous weather-related calls across the region.